Its tough to have a definite feeling about this Michigan team after these first two games. On one hand, Michigan did everything they should have done yesterday against a vastly overmatched Western Michigan team. Higdon and Evans ran the ball very well, Patterson was accurate and poised, special teams looked solid, playcalling was effective enough to pull away from a far lesser opponent without having to give too much away for future opponents. But on the other hand...it's just Western Michigan...the easiest game on Michigan's 2018 schedule. Everything that happened yesterday was exactly what should happen when you play a team like Western Michigan. I'm not going to read too far into anything that happened yesterday, just like how I didn't read too far into anything that happened in South Bend a week earlier. Just be happy that Michigan played like Michigan should in a game like this. The offense is still figuring themselves out. They have some great pieces and parts. The Higdon/Evans combo is as good as any duo in the country. Shea Patterson is a baller...no question about it. He can put the ball anywhere on the field with ease if he has the time to do so...and he can do it on the run too, which is really where Shea shines as a playmaker. The receivers and tight ends compliment Patterson's ability quite well. Shea likes to spread the ball around and he can do so with a bevy of talented options around him. I was happy, actually, to see no changes on the offensive line this week. I want this unit to gel and get more reps together. Consistency is the key for Michigan and you can't get there by constantly changing things up front. Things went well for the OL yesterday and hopefully that's something this group and build from. One thing I've really been impressed with is Patterson's ability to scramble and find the receiver downfield to throw to. I feel like most QBs would easily take the 5-yard dump off to the tight end or running back, but Shea sees the receiver 15 yards downfield and puts the ball right where it needs to go. That's his best asset so far in this Michigan offense. The trick is, getting everyone to be on the same page. That's what yesterday was all about. Aside from padding the stat sheet, games like this are so incredibly important from a cohesiveness standpoint. Michigan's offense needed this game. They're going to need next week versus SMU as well. The CFB season is a grind, but it also flies by. Michigan has little time to gel offensively before things really start to ramp up again. Nice to see a lot of backups get reps in the second half. Again, that's what this game was all about. Feel good about everything that happened yesterday. Enjoy it, don't minimize it. Really the key to victory was getting the offense clicking and that wasn't going to happen unless Michigan could run the ball effectively. The first drive was a dud, but it didn't take long for Higdon to make his mark on this game. His 43-yard run in Michigan's second drive and the 67-yard touchdown run on the following possession were exactly what this offense, and this team, needed. All told, Higdon's 156 yards on just 13 carries and Evans' 86 yards on 10 carries...and the 3 touchdowns between them were the best part of the game for me. Yes, WMU's run defense is not very good...but hopefully this spark will be enough to ignite the confidence of running game going forward. If Michigan can run the ball effectively enough to make that part of their identity...then Shea Patterson's job only gets easier as a passer and playmaker. The key to success for Michigan this year, or any year, is balance on offense. Hopefully yesterday was a step in that direction. There really wasn't too much to be disappointed about yesterday. There was a missed 40-yard FG attempt by Nordin in the 3Q. There was that personal foul for the late hit out of bounds by John Metellus. That's about it, really. When Michigan rolls to a 49-3 win versus anyone...this portion of the recap is going to be a little light. Let's enjoy that this week. It was a tie this week. 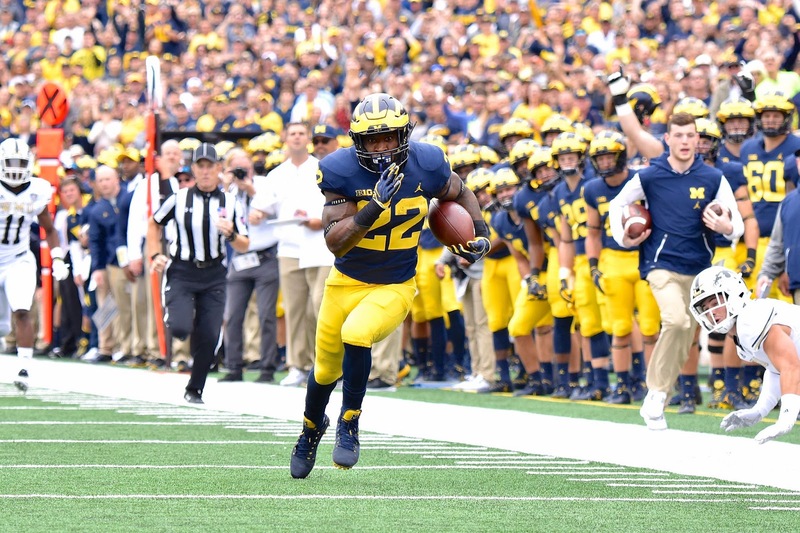 Higdon was the early spark Michigan needed and Shea was spot on all day long going 12 of 17 for 125 and 3 touchdowns (including 2 to receivers!). Not huge numbers...but they didn't need to be. His TD throw to DPJ was a thing of beauty...I can't remember the last time a Michigan QB threw a pass like that into a small window like that. Rashan doesn't light up the stat sheet, but it's things like this that show you why. He finished this game with 6 tackles, 1 sack, 1 QB hurry and 1 TFL. He's a game-changer even if his name isn't being called every other play. Michigan's defense is absolutely loaded and I could've picked from probably 9-10 other guys for the defensive game ball this week...so I picked Gary because he's just so damn good. It's a simple policy I have...score on a kick/punt return or block kick/punt...get a game ball. Nice block, sir. Pitched a shut out until a garbage time field goal spoiled the party. His unit rebounded well from an ugly opening start to the first game. Like I mentioned, pretty much anyone from the defense could've taken home the game ball...and that's a testament to being a very well coached unit.